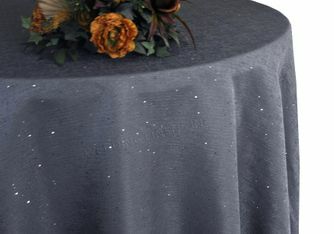 108 Pewter Paillette Sequin Burlap Polyester Tablecloths Free Shipping over $150 - US 48 Contiguous States! $9.98 Flat Rate Under $150 - US 48 Contiguous States! Condition: Wholesale brand new high quality 108" round Paillette Poly Flax sequin table covers, Sequin table cover linens, sequin polyester tablecloth. How to Care: Polyester Flax Sequin Table Cloths are HAND-WASH ONLY. Add gentle washing powder or small soap flakes to warm water and make sure that the detergent or flakes are thoroughly dissolved. Turn the table cover inside out prior to washing. Rinse the sequined table cover with cool water. Remove from the water and lay on a towel in the shade to drip dry. DO NOT BLEACH OR IRON.